PUPILS, teachers and staff rolled up their sleeves for a highly successful Phil the Bag charity event. 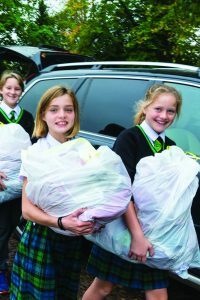 Ripley Court School set about filling bags with unwanted items including shoes, clothes and linen. And when they had finished, the team had collected 267 bags which were squeezed in to a collection van. In fact, more than 20 bags couldn’t fit in and will be collected at a later date. Now the bags are being weighed and the textiles will be sorted, sold and distributed to people in developing countries. The school has taken part in the Phil the Bag project for several years and has already helped renovate and paint classrooms for children at Mtswayeli, Ngamo and Kapane Schools in Zimbabwe, an initiative driven by Imvelo Safari Lodges. This year’s donations will help renovate and paint another classroom, as well as provide pupils with proper furniture like tables and chairs. Senior Master Steve Brunning said “It’s always great to see the students contribute to this project which we take part in every year. “Their excitement and passion to help other children to improve their school life is great to see.